All week my attempts to acquire tickets to the Davis Cup Tennis Match turned up dead ends; I stalked Ticketek via phone and website, I called people who might know people, I even showed up at the match on Day 1, stood in line for forty-five minutes with some cranky, snotty old guys dressed up like they were going to high tea--- only to be shut out. And my sister said, you'll get tickets. Don't even say that you won't. And I was thinking that same thing, but was slowly starting to accept that it might not happen. So I marched on, and with today being Day 2 of the three day tournament, I conceded that sometimes it doesn't all happen-- and that's okay, as Tony Robbins would say, "There are no failures, there are only results." 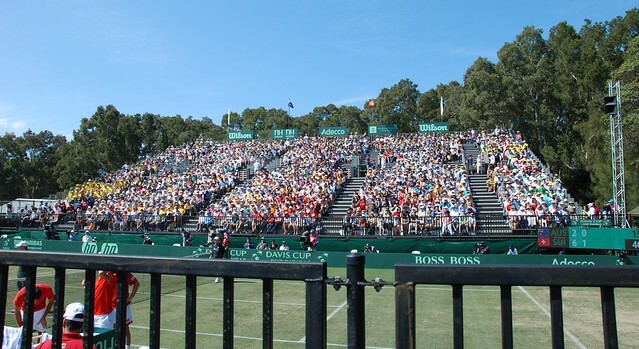 Then we went to the seven year old's tennis lesson this morning, during my break from ball-boy duty, I received an eBay message that Davis Cup tickets had just been listed. Upon reaching the seller (a.k.a. "The Ticket Pimp") he says he's at a restaurant a couple minutes away from us, and he has front row seats with our name on them-- for the match that starts in 90 minutes. Woooo freaking hoooo! FRONT ROW, BABY! So I'm all, "We'll be there in five minutes to get the tickets." And he's all, "First come, first serve-- I'm sittin' here." And I'm thinking, is this for real? I had been willing-it to happen JUST. LIKE. THIS. all week long... and it's really going to? Really? YES! That is, unless we pay, the tickets end up being fake, and we walk away sad losers... hmmm, that sure would be unfortunate. But I am a truster, and I am willing pay the trust tax if necessary to believe this is the real deal, because I KNEW it was going to happen all along... I just knew it. I jump into action and shout onto the tennis court to my seven year old, whose coach just told him they were going to play a "real match" for the last 15 minutes of their lesson, "Honey, we need to leave-- I got Davis Cup tickets!! 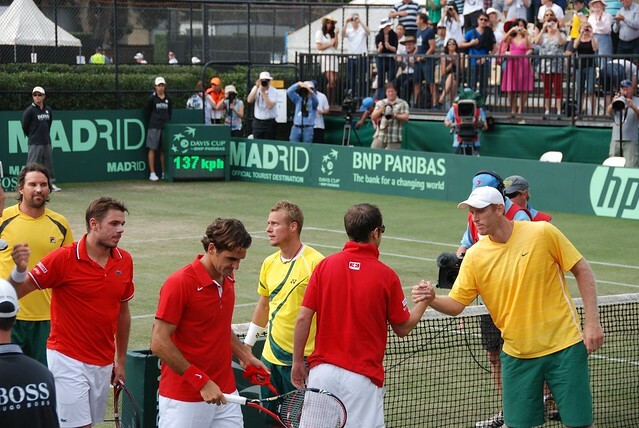 I got the Davis Cup tickets!! We need to go get them before he sells them to someone else... let's go!" And then he whines (or whinges if you're Aussie), "I can't go right now, we are about to play a real match. Can't we go afterwards???" 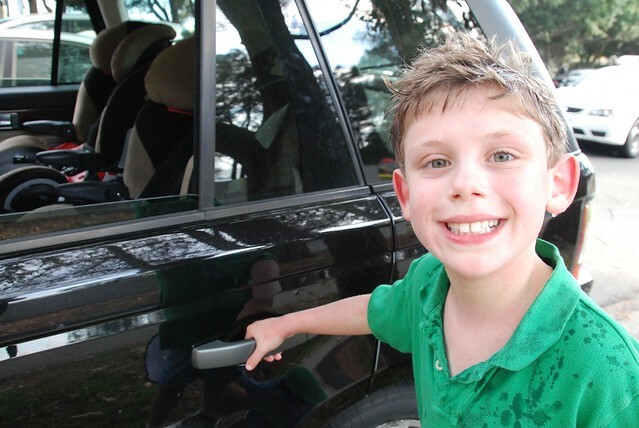 At risk of becoming Crazy-Ameri-Mum in public, I think I threatened him with a week of no-ipod if he didn't, "Get in the car NOW!". Thankfully, he shut his piehole and we rushed down the street. As we approached the rendezvous point I saw The Ticket Pimp walking anxiously up and down the footpath (that's Aussie for "sidewalk"), he had that I'm-looking-for-someone, but-I-don't-know-what-they-look-like face on... so I was pretty sure it was him. And.... just like that... BAM!... 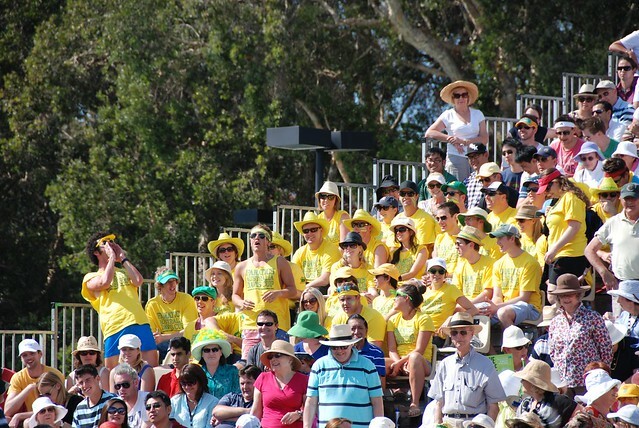 we had front row seats to the hottest game in town, Davis Cup Australia vs. Switzerland. After dashing home and wolfing down some Oporto Chicken Rappas, we were on our way. I pulled into to my favorite carpark (that's Aussie for "parking lot")-- full. Damn. Headed back onto the main road and BAM! Perfect massive spot to parallel park in, directly across the street from the entrance. Seriously, it seems obvious that our day has come. We have arrived. 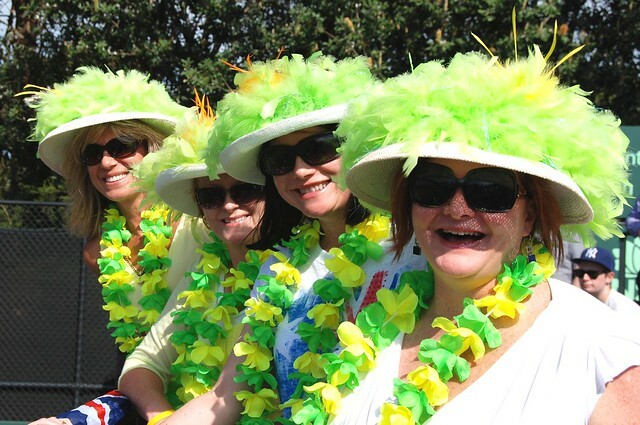 We were late enough that there was no line to enter the Royal Sydney Golf Club, and before we knew it, we were in. Roger Federer, Lleyton Hewitt, Stanislas Wawrinka, and Chris Guccione-- alive and in person-- merely feet from us, or metres if you're all metric and whatnot. And if all of this goodness wasn't enough, we were lucky enough to be seated on the west side which was almost completely shaded from the searing Aussie sun which was as strong as it comes today. The little sub-climate at our seats was a cool, breezy 20ish degrees Celsius- that's probably about 65 Fahrenheit? The temporary seating we'd seen them put up earlier in the week-- I heard it was three or four thousand seats. Aussie, Aussie, Aussie, Oy, Oy, Oy! (FYI- our colors are green and yellow). 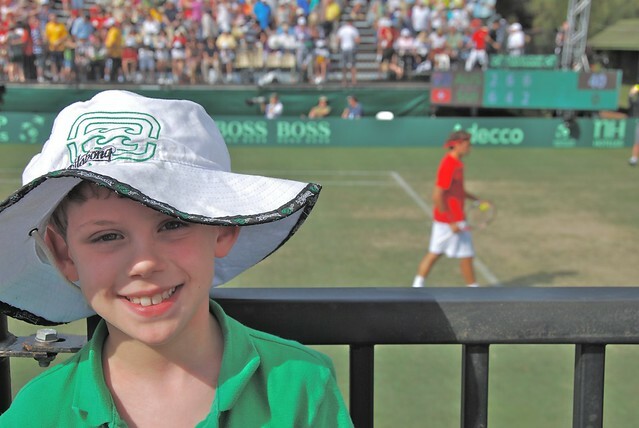 The tennis-fanatic seven year old and Roger Federer, who would clearly be unaware he is taking part in such an important photo. 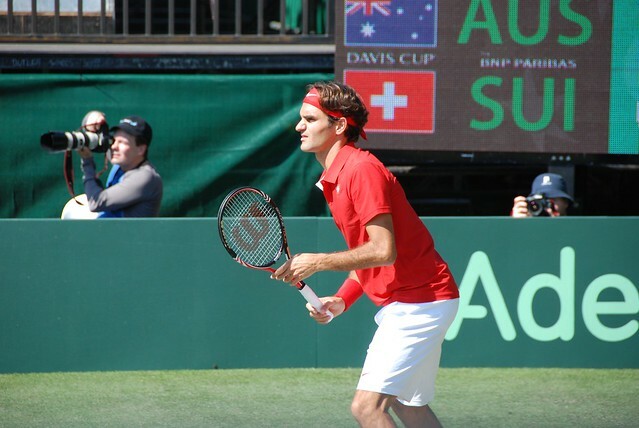 Federer in deeply focused, as he should be :). The award winners for "Most Enthusiastic Fans". They kept the match rockin', literally... those temporary stands are pretty darn flimsy. This was the first professional tennis match I've been to, and was quite intrigued by the umbrella-holding girls during the quick breaks. Note: I am totally in support of as much shade as possible. It was such an exciting match, and the Aussie took it home! After the match, there were mini-tennis courts set up, which was incredible considering he was harassing me that he wanted to play tennis "RIGHT. NOW." After four hours at a tennis match, he seriously wanted me to take him to play. Could this have been any luckier a find??? He was so hot and schweddy after playing tennis with the other kids that we decided the best way to top it all off would be by pouring the remnants of his water bottle on his head for an instant cool-down. YAY! I love when all the pieces fall into place like this! Plus, you scored some MAJOR Mommy points with this one! Point to FL Girl in Sydney. I knew this was a once in a lifetime chance and was sure we needed to be there and sooo glad we were! Such a great day with my little man-boy. Love love love this story. Tears of joy reading it. Law of attraction baby. I gotta work on that. Jill- So funny-- thanks for keeping the flame alive on this one for me. Nursemyra- I know, I love it and I hate it. He even has grown up teeth now. Lindsay- that is sooo funny! Awesome! We had so much fun. Marvin & Anon- Thanks to both of you-- and OMG I can't believe I didn't know that!